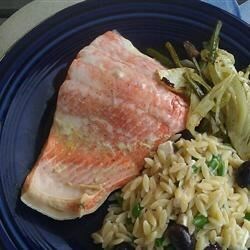 "This poached salmon is a family favorite and its easy to do. I suggest serving rice and a veggie with this meal." simple, easy and delicious. I squirted a little lemon juice in the chicken stock, and added a bit of pepper to the filets. turned out great! Super easy! I made it with garlic and shallots in the broth. Foolproof and elegant!